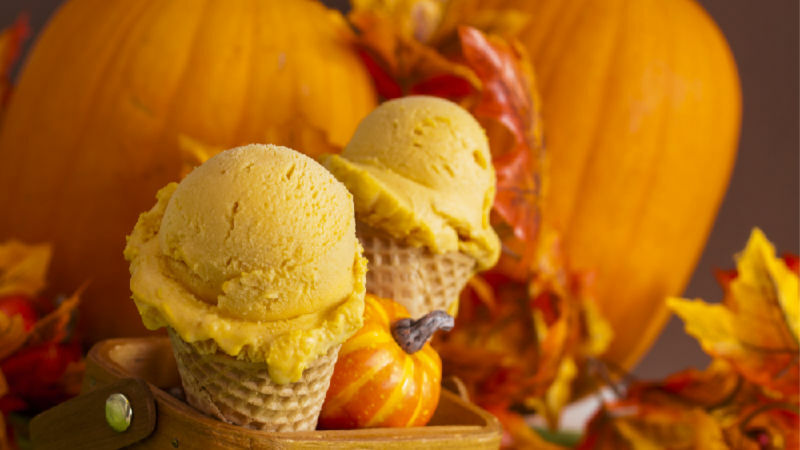 This is a simple recipe for making pumpkin ice cream. You can buy half a Kent pumpkin for about a dollar at the supermarket and just boil it until soft. It doesn’t take long but if you’re in a hurry, you can buy pumpkin puree in a can which works fine. There are some cans of pumpkin which are used for pie filling that have other flavours added. Avoid this type and stick with pure pumpkin puree. Crumble up some gingerbread biscuits and scatter over the top of your ice cream or add into the ice cream just before it’s finished churning. Choux or short crust pastry is delicious in this recipe. Add cream and milk to a saucepan and stir on a medium-high heat until it begins to simmer. Remove from heat. Continue heating mixture on a medium heat until it thickens and coats the back of a spoon - then remove from heat. Add milk mixture to a blender along with pumpkin, brown sugar, vanilla and cinnamon and blend for 1 minute. Strain ice cream base into an airtight container and cool in the fridge for 2-3 hours until completely cooled. Churn in an ice cream maker as per manufacturer's instructions then pour into container and freeze for at least 2 hours until hardened. No Replies to "Pumpkin Ice Cream"